Et pour prouver que vous n'êtes pas un robot : 3 plus 3 = ? Jacques Marcuse - son Livre d'or ! 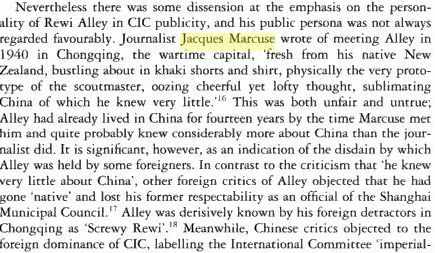 "Another good friend in those days was the journalist Jacques Marcuse, a Belgian who represented AFP in the Chinese capital in the 1960s. At a time when the Western media were represented only by Reuters and this agency, he was a familiar figure, distinguished by his monocle, and his sardonic humour. He had lived in Shanghai in the late 1930s and knew some of the leading figures from that time; this made him a cynic and sometimes rather sharp in his judgments. Jacques also had a fund of jokes, most of which he swore were true stories. His book “Peking Papers” contains many of the outrageous stories which I had heard first-hand from him - not always to be taken literally, but poking fun at some officials and others who were excessively serious. An example was his habit of inventing his own so-called sayings of Confucius - Jacques claimed that there was no one who ever responded that the “saying” cited was bogus, or that he did not recall any such statement by Confucius. Jacques was admired by his friends for another reason; at the bar at Beijing Airport, he had a standing arrangement to have “his” bottle of Maotai. Friends were welcome to dip into it as they awaited delayed flights - all one had to do was to call for Mr. Marcuses’ bottle!